Without a doubt, Patty Jenkins’s Wonder Woman is the very best of the recent “DC Extended Universe” superhero films – yet the praise doesn’t mean as much as it should, inasmuch as its undistinguished precursors – Man of Steel (2013 – review here), Batman v Superman: Dawn of Justice (2016 – review here), and Suicide Squad (2016 – review here) – set the bar very low, to put it mildly. (Indeed, one might ask, how could this film possibly have been worse?) Since there are plans for as many as sixteen additional installments of the series, one fervently hopes that their creators will study Jenkins’s film very closely, in order to understand why her film works when the other ones didn’t. One important lesson to learn seems obvious enough: since the DC superheroes first became popular because of their appearances in comic books, filmmakers should generally remain faithful to the contents and spirit of their original adventures. One of the irksome aspects of Zack Snyder’s Man of Steel and Batman v Superman: Dawn of Justice was his willingness to tinker with Superman’s and Batman’s back stories and ignore facets of their established characters, so that one watches these films regularly thinking, “Superman would never do that,” or “Batman would never do that.” In contrast, though Snyder is co-credited with Wonder Woman’s story, its other writers – Allan Heinberg and Jason Fuchs – must be primarily credited with a film that, with minor changes to be noted, is remarkably faithful to the longstanding traditions of Wonder Woman (even though she is never called Wonder Woman in the film), projecting a strong awareness and respect for the three aspects of the heroine that make her almost unique (and her gender, though relevant, is not the most significant issue). First, while the abilities of most superheroes are given scientific explanations, Wonder Woman is a product of magic, long ago imbued with great powers by the ancient gods of Greek mythology and, along with her countrywomen, granted immortality and residence in an isolated, paradisal island (though the comic books also depict her Amazons as masters of superscience). Her background provides her with a special aura of gravitas and wisdom, enhanced by her official status as her island’s princess, and makes her a heroine that always commands respect, despite her incongruously revealing outfit. Here, Jenkins risks boring viewers with a slow opening sequence in order to describe the upbringing of young Diana (Lily Aspell, Emily Carey) and the reasons why the adult Diana (Gal Gadot) develops her unique perspective on the twentieth-century world, as her training includes the points that “Fighting does not make you a hero” and “War is nothing to hope for.” And while her mother Hippolyta (Connie Nielsen) describes her as “naïve,” and the film derives some humor from Diana’s unfamiliarity with western customs of dress and decorum, it also becomes clear that she is both stronger and wiser than everyone around her. Second, Wonder Woman is not an American – neither a natural-born nor naturalized citizen. She is a citizen of the island of Themyscira, of Greek descent, who chooses to live in and assist America, but she does not adopt American attitudes or display blind loyalty to its practices. As well conveyed by Gadot’s foreign accent, Wonder Woman is an outsider who, like William Dean Howells’s A Traveler from Altruria (1894), can see the Europeans she encounters with fresh eyes and aptly criticize how they conduct their lives: with settings like Themyscira available, why do Londoners endure life in their “hideous” city? Why should generals sit in offices instead of fighting on battlefields alongside their soldiers? Is there a real difference between a secretary and a slave? Is it fair to kill someone without giving him a chance to defend himself? Finally, while most superheroes are motivated by a general desire to help other people (Superman, the Fantastic Four), or an obsession with fighting crime (Batman, the Punisher), Wonder Woman’s special priority is bringing peace to the world; and though she recognizes in this film that the British and American combatants are generally better than their German opponents, she wants an end to hostilities more than a British-American victory. One of the most striking moments in the film comes when she confronts her ally and boyfriend Steve Trevor (Chris Pine) and charges that the war god “Ares has corrupted all of you” – both the Germans and Trevor and his compatriots – and she declines to assist in his planned mission. Few films have the courage to suggest that their ostensible heroes may be just as blameworthy as their ostensible villains. This brings me to the second reason why Wonder Woman is superior to other superhero films. The general policy in such films is to first introduce the hero and show him doing something nice (like rescuing people from a flood, or protecting an old woman from a mugger), thus instructing audiences that they should be rooting for him. Then the villain is brought on the scene, and he is shown doing something nasty (like killing a nice old man, or kidnapping somebody’s mother), thus instructing audiences that they should be rooting against him. Several skirmishes then lead to a final, all-out battle between the hero and the villain designed to make audiences cheer with delight when the virtuous hero obliterates the despicable villain. It is all as contrived as a World Wrestling Entertainment match between a man dressed as Uncle Sam and a man dressed as Osama Bin Laden. In contrast, Wonder Woman is struggling not simply to defeat some scoundrel who engages in reprehensible behavior; she is striving to end conflict itself – in this case, World War I – and thus protect everyone, both good and bad, from its harmful effects. Her battles actually mean something; she is fighting for a good cause, and one that is deeply relevant to the contemporary world. As noted elsewhere, portentous pronouncements about life, the universe, and everything are commonplace in action films, but in this film they actually seem appropriate, as they precisely address the difficult issues Wonder Woman is wrestling with. And the emotional highlight of the climactic encounter is not the inevitable death of the chief villain, but rather the time afterwards when the ordinary soldiers around Wonder Woman get up, take off their gas masks, look around at the now-silent battlefield, and smile with joy to realize that the long ordeal of war is finally over, for both the British and the Germans. Indeed, Wonder Woman repeatedly delivers a sharp rebuke to the innumerable other films, like Man of Steel and Gareth Edwards’s Godzilla (2014 – review here) , that display complete indifference to the suffering of thousands of innocent victims to focus solely on the happy fates of the few characters that audiences have been properly conditioned to care about. In this film, as Wonder Woman, Trevor, and their companions pass by various anonymous people in distress, Trevor (who clearly understands film conventions) keeps telling her that they all have to be ignored so that he and the others can proceed to picking up their next plot coupon, saying, “We can’t save everyone in this war.” But Wonder Woman didn’t get the memo. She insists, indignantly, that “We need to help these people,” even if they aren’t the stars of the film, and at one point she impatiently ignores Trevor’s instructions and goes out into No Man’s Land to rescue some villagers being oppressed by occupying Germans. Once she and her friends have defeated the Germans, the relieved villagers celebrate them as heroes, and together they all enjoy a relaxing evening of dancing and drinking beer. Later, when the same village is subjected to an experimental attack of lethal gas, Wonder Woman staggers through the fumes, movingly stunned and saddened by the realization that all the people she interacted with are now dead; and audiences are moved as well, even though not one of the victims was ever given a name or a back story. This, then, is not a matter of moving chess pieces around a table; this is intelligent, moral storytelling of a sort that is sadly rare in contemporary action films. 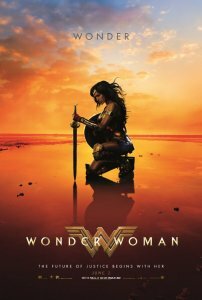 Interestingly, the film also declines to echo one persistent undercurrent in the comic books: the notion that the world outside of Themyscira is flawed because it is “Man’s World,” or “Patriarch’s World,” and it is the mission of Wonder Woman to bring admirable feminine values to a world unfortunately dominated by lamentable masculine habits. However, except for two brief references to “the world of men,” the film contains no rhetoric of this kind: instead, it consistently states that people cause wars, not men, and the film tellingly underlines that point by making a female villain, Dr. Maru, the inventor of the war’s most horrific weapons. Further, while I strive to avoid reading anything about a film before I review it, I noticed a link in one website to an article evidently complaining that this version of Wonder Woman is “less American” than previous renderings. To which I say: thank goodness! As already noted, Wonder Woman was never an American anyway, and there have been too many movies explicitly or implicitly arguing that Americans are morally superior to other people; this film briefly offers a contrasting view when Trevor’s Native American guide, the Chief (Eugene Brave Rock), explains his decision to cynically focus on making money as the result of Trevor’s people taking everything away from his people. It’s refreshing to see a film wherein a sole American hero, Trevor, is primarily aided by an Amazon, a Muslim of (I believe) unspecified origins, a Native American, and two Englishpersons, and filmmakers were also careful to make Themyscira’s Amazons ethnically diverse. The only departure from inclusiveness is that Dr. Maru, or Dr. Poison, a Japanese princess in the original comic books, is here played by a Spanish actress, given the first name of Isabel, and assigned no nationality; yet this can be defended on the grounds that Japan was not a German ally in World War I, and advocacy groups are unlikely to complain that the film failed to hire an Asian actress to portray a homicidal psychopath, devoted to developing more and more lethal varieties of poison gas. A third lesson to draw from Wonder Woman is the importance of casting. Making a superhero film, one might think the only important requirements are attractive protagonists and superior special effects; and the DC films have not always been attentive to finding the best possible performers for their efforts. Henry Cavill and Ben Affleck are satisfactory as Superman and Batman, but no one would call them the best actors ever to play those roles, and there have been some major lapses in the casting of other characters (Jesse Eisenberg as Lex Luthor, Jared Leto as the Joker). In contrast, Jenkins has assembled a virtually ideal cast. True, the best casting decision may have come before her involvement – Gal Gadot as Wonder Woman. Like her predecessor Lynda Carter, this tall, statuesque brunette certainly looks the part, but her chief virtue may be that she is a rare actress who is also an experienced soldier, having served two years in the Israel Defense Forces. And, while I suspect that she received very little training in the sorts of acrobatics and sword play that characterize Wonder Woman’s style of fighting, she nonetheless brings a real sense of conviction both to her battle scenes and her revulsion against the effects of actual warfare. However well they might act, one suspects that Cavill and Affleck are really kind, gentle people who would not be particularly effective in a real-life conflict; but I would never want to get into a fight with Gal Gadot. As for her principal companion, Chris Pine’s Steve Trevor, I have no complaints about his performance, save that he unfortunately bears little resemblance to the way that the character has usually been drawn, something that consistently bothered me during the picture but may matter little to other viewers. And it’s a shame that Lucy Davis’s Etta Candy wasn’t given more to do, given her longstanding prominence in Wonder Woman stories, particularly since she announces her willingness to engage in “fisticuffs” if absolutely necessary. So, as Joss Whedon struggles to improve what I am sure is the mess he inherited from Zack Snyder – the forthcoming Justice League film, now represented by a most unpromising preview – and as other filmmakers work on their own superhero films, Jenkins provides them with some important reminders: read the comic books attentively and follow their lead, so when your end credits automatically thank all of the writers and artists responsible for those stories, they can feel like their work was truly valued; develop a story that has substantive resonances with real-world issues, rather than a mechanical good-guys-versus-bad-guys routine with an overlay of platitudes; and carefully cast the film as if directing an intimate character study, not a mindless action film. If these steps are taken, I could actually start looking forward to, rather than dreading, my next superhero film to review. Gary Westfahl has published 25 books about science fiction and fantasy, including Science Fiction Quotations: From the Inner Mind to the Outer Limits (2005), The Spacesuit Film: A History, 1918-1969 (2012), A Sense-of-Wonderful Century: Explorations of Science Fiction and Fantasy Films (2012), and William Gibson (2013); excerpts from these and his other books are available at his World of Westfahl website. He has also published hundreds of articles, reviews, and contributions to reference books. His most recent books are the three-volume A Day in a Working Life: 300 Trades and Professions through History (2015) and An Alien Abroad: Science Fiction Columns from Interzone (2016), now available from Wildside Press. Mmm. Haven’t seen it (and don’t expect to)…but from what you say, it suggests some sort of “moral equivalency” has been set up between the two sides of WWI. That both have good and bad…that there’s no real difference between the two. I don’t want to recap a massive amount of history, but suffice it to say that Imperial Germany and Austria took quarrels with small nations into nations not involved, that they intended to rewrite the map on the strength of their strength, and that the Allies dared to stand up to this and it cost them millions (in money and in lives) to defeat this. The hints at a pacifist message are there. But in the end, Wonder Woman does kill Ares…twice! What if Ares had just said, I’ll give you another twenty years to think about it, instead of simplifying the plot with justifiable homicide? Plus they added the extra motive of revenge for her heroic lover. Also, it is no accident that Wonder Woman ends up charging the German lines even as the plot (and history) says they are on the retreat. How are they supposed to be abusing the innocent French civilians when they aren’t advancing? As for Zack Snyderism (which is Frank Millerism and Christopher Nolanism, even though they get good PR and Snyder doesn’t,) the climax really does take its weight from its belief that the extermination of humanity is a reasonable thought. The movie is too long. Also, Ludendorff later joined with Hitler to attempt the overthrow of the Weimar state. Here he’s supernaturally influenced, and drugged to boot, then killed in a case of mistaken identity! Kind of lets the real dude off the hook, morally speaking. The Kaiserreich wasn’t as bad as Adolf Hitler’s Third Reich. This is, however, a… very… low… bar. It was still a brutal, aggressive, militaristic authoritarian state with radical ambitions. It was Germany — with able assistance from Austria-Hungary — that decided on war, declared war on its neighbors, invaded them, and radicalized and brutalized both the means used to wage the war and its ends. Germany was a revisionist power and it intended to destroy the European state system and crush the independence of the other Great Powers. Take a look at the terms it forced on Russia and Romania in the treaties of Brest-Litovsk and Bucharest; take a look at their “September Program” (September 1914) when Chancellor Theobald von Bethmann-Hollweg outlined Germany’s war aims. By comparison the Versailles treaty — whose undeserved bad name is a case of the losers writing the history-books — was a love-pat. Basically, Germany in WWI did all the things it did in WWII, with the solitary — albeit extremely important — exception of setting out to kill all the Jews in the world, which was Hitler’s unique contribution. Massacre of nonresisting civilians? Check. Mass deportations for forced labor? Check. Deliberate infliction of famine? Check. Ethnic cleansing? Check. And so on and so forth. WW1 and WW2 were episodes in the same struggle, with a 20-year armistice in the middle. That’s very interesting, Stephen, and (to this non-history major) sounds plausible, so I wondered if you could recommend a book about the Great War, let’s say of no more than 500 pages, that would support your points — ?